Links — LAKE OSWEGO BOAT CO. These talented, committed folks share our passion for all things woody boat. If you're equally inclined, we urge you to support them. We do! Woody Boater: A special place to celebrate boats that give back to your soul. If you want to live and breathe the wooden boat lifestyle, there’s no better place to do so than with Woody Boater. Being a part of Woody Boater is a way for folks to keep up with the community and all that is going on. Finding and saving lost boats, lost stories on lost waterways is their passion. Woody Boater is a state of mind, a place to enjoy woody boating when you are not out on your boat, or if you just want to enjoy the world that surrounds these fun classic water craft. Being a part of Woody Boater is a way for folks to keep up with the community and all that is going on. Finding and saving lost boats, lost stories on lost waterways is our passion. The art, boat shows, destinations, people, and your conversation are the fuel that drives us. There are on any given day about 10 of us roaming around our parts of the world looking for your stories and boats. In fact just by reading this, you are now officially deputized and are now a Woody Boater. Jim began his career in Southern California in the 1980’s as a freelance designer and art director for a variety of Southern California-based magazines, including Sea, Lakeland Boating, Rudder, Road & Track, and Cycle World, among others. Then, as art director and contributing photographer, Jim produced the first definitive book on the sport of boardsailing, The Sailboard Book for noted action sports author and photographer, Jake Grubb. After nearly 40 years of art and photo direction, Jim is gradually getting back behind the camera, applying his talents and substantial technical skill to impeccably-produced, fine art images. With sailing in the blood (at least 10 generations, but who's counting?) and a love for boating in general, nautical portraits for woody boater clients is a passion close to his heart. Examples of his woody boat work can be found throughout this website. For more of Jim's work, or to inquire about having your wooden runabout photographed, visit his website here. As his flickr feed states, Justin Riede is a sign painter, guilder, carver, and artist of distinction. That he is. Justin may be a man of few words, but it's only because his extraordinary typographic sensibilities, keen eye, and steady hand speak volumes about his talent. Justin has been a valued partner on many LO Boat projects and is responsible for the beautification of many a transom, storefront, brick wall... you name it, he's done it well. No doubt you've seen (and surely admired) Justin's incredible work. Justin's complete contact information is right here. Or, you can email him directly here. The mission of the Chris-Craft Antique Boat Club (CCABC) is to maintain the rich heritage of Chris-Craft through research, communication, and education; to encourage the use, preservation, and restoration of Chris-Craft boats; and to enhance the experience of owning a Chris-Craft. Owning a Chris-Craft is not a prerequisite for membership. Many of our members own boats other than Chris-Craft and some may own no boat at all. We encourage owners and enthusiasts to become active and involved members. The CCABC is a not-for- profit organization whose governing body is elected by the membership. The Club is supported by membership dues, our Sponsorship Program, our advertisers, and through tax-deductible donations. Annual membership includes full access to our website resources and quarterly issues of The Brass Bell, our premium publication. Share your passion of antique and classic boating. For more information, click here. The Antique & Classic Boat Society (ACBS) is dedicated to the preservation and restoration of historic, antique and classic boats and provides education about their heritage. From the time of its first official general meeting and board meeting of officers and directors on February 9, 1975, in Boston, the Antique & Classic Boat Society (ACBS) has been dedicated to bringing together people with a love of antique and classic boats and boating. Our mission is to promote the love and enjoyment of all aspects of classic boating. In furtherance of that goal, ACBS also provides scholarships to worthy students seeking careers in the field of antique marine restoration and preservation. ACBS also acts as a central governing body for the classic boating hobby and our chapters. Membership in ACBS also provides access to a range of information ranging from our award-winning magazine, The Rudder, to restoration videos and numerous member discounts, including discounts on boat insurance. Our regular activities include boat shows, restoration symposiums, and quarterly meetings in some of the most beautiful boating areas in North America. For more information, click here. 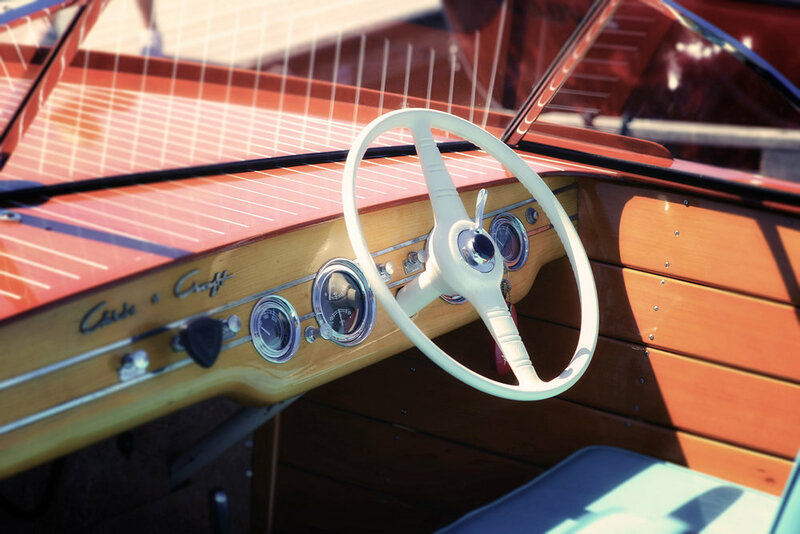 Hagerty is the world’s leading provider of classic boat insurance. We were the first and continue to be the best to offer Agreed Value boat insurance. Our vision to provide coverage that gives you peace of mind about insurance for your historic vessel has been unwavering for over 30 years. For more information, click here. Plain and simple, we use them because they're, well, top notch. Top Notch Fasteners offers the highest quality fasteners, reliable service, and many years of fastener experience. The sales team is headed by Ron Pimm. He has been involved in the fasteners industry for over 40 years. Servicing the Navy, GSA, world wide marine industry, industrial and fastener companies. For more information, click here.